Cheltenham’s friendly neighbourhood restaurant and bar. A favourite of locals, The Tavern started with a simple mission…to deliver delicious food at reasonable prices. Our mission remains the same. Tuck in and experience locally sourced, British produce that’s carefully crafted into punchy and full flavoured dishes. Savour your way through our taverna style menu from Tavern Classics, filling Hereford Beef Short Rib and of course finishing with some utterly sinful puddings. Our talented bartenders use fantastic local produce to create some of the finest cocktails in Cheltenham. Muddling and mixing the perfect ingredients to emulate an old favourite or a new creation. Their experience, knowledge and awards for service make them a bar team to be reckoned with. Had a lovely evening at the Taver. Food was delicious and staff very friendly and attentive. Drinks little bit pricey. Some sort of and offer would be nice. 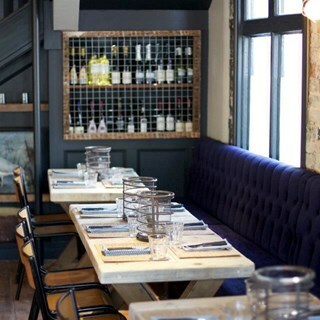 Loved our first experience of the Tavern - great quality, fresh food..delicious! And helpful, friendly staff. Thank you - we’ll be back! Booked for Sunday lunch. Weren't provided with a Sunday lunch menu so queried this. Was told that Sunday lunch was sold out, but no warning on website or by email/phone that Sunday lunch could sell out, so we were disappointed. No apology when we queried availability. Service was ok after this if a bit slow. Food was great as was atmosphere. Didn't like having service charge automatically added so asked for it to be removed. Would go again but would be careful with booking times and expectations. Really great staff and accommodating when we asked if we could move tables from a high seated table to a lower one. One of the best roasts around! Amazing service from all the staff and we were a very demanding table! Couldn’t recommend it enough. Good food, good company and a great venue. Note for others - Wine by the bottle MUCH better value than by the glass. Evening only slightly spoiled by table opposite whose default volume level was 11 and only got louder as they got drunker. But - the staff dealt with them appropriately. I have visited 3 times previously and had excellent food and great service. However on Sunday evening the service was slow, 3 items my wife and I wanted were sold out and the whole experience was a real disappointment. I don't subscribe to the whole "we were really busy because of Mother's Day" - this day is not a shock, it is an engraved date every year and a business with your reputation and price structure should manage supply better. I would think very hard about coming back. Food was excellent, service was great too! Not much draft ale on offer. Personal bug bear of mine is when bars serve any drink other than Guinness in a Guinness glass. Looks cheap and off brand. Service was beyond amazing, we had the top floor to ourselves and everything went smoothly. Thank you! Great food, atmosphere and value. Would return time and time again. A quiet Tuesday lunchtime meal, but the service was great service and food was good. Good burgers and gluten free well catered for. I had made a reservation days in advance, but my reservation did not appear on their system. The staff eventually found me one in the corner... Wine was expensive for what was offered. I went for Sunday roast, the beef was very tough, although my girlfriend had the pork which was much nicer. All-in-all a bit of a dissapointment in my opinion. Lovely atmosphere, great environment, good food. Outstanding service and dining. Very busy evening on the final day of the Cheltenham festival. The staff was on top of everything. We had a large group of 10. Everyone raved about the evening. Well Done!! Wow!!! So if you haven’t eaten here before, you really need to! The food is amazing, I had Soufle and Boeuf borginion. It was out of this world. The staff are amazing too. The Tavern have got “everything right”. Well done. We had breakfast on Tuesday and thought everything was great but then on Friday, when our group was much bigger (11), it wasn’t nearly as good. The eggs were over cooked, the bread hadn’t been toasted (more like just warmed) and the increase in drinks prices was disappointing. We appreciate that the Friday will be your busiest day but with premium prices being charged, standards shouldn’t really be compromised. We arrived for our booking at 6:30 and was told, before we even sat down, that you’d need the table back by 8:30. We were then told the same when we received our menus. The service was slow, I had to chase my drink order, which was wrong when it arrived. We had to wait ages for my brother desert and our coffees were cold when they arrived. Fab service but prefer to choose own amount for tip.